Our lungs are two large balloon-like organs inside our chest cavity, nestled behind our heart and the upper part of our stomach. 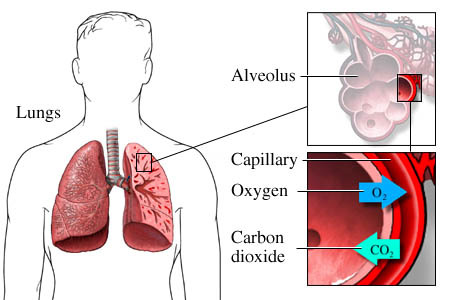 Through the help of the lungs and the body’s circulatory system, oxygen is distributed to internal organs, and carbon dioxide is expelled from the body. This pair of spongy organs is normally filled with air, and not fluids. However, when fluids build up inside the lungs, it prevents the usual exchange of oxygen and carbon dioxide from happening, which can cause health problems, and even death, later on to the unlucky patient. But why does fluid build up in the lungs in the first place? A person can have Lung Water, or pulmonary edema, when fluid builds up within the alveoli. If the fluid builds up around the lungs, then it is called pleurisy or pleural effusion. * Fever and other symptoms may occur according to the specific etiology. One health problem that can cause fluid build-up in the lungs is a heart ailment. A weak heart can cause circulation problems. When the heart fails to pump enough blood, pressure builds up in the blood vessels around the lungs. As this pressure rises, blood gradually seeps from the capillaries, which are tiny blood vessels, into the alveoli in the lungs. Enough blood seepage can result to Lung Water, or pulmonary edema. Pulmonary edema due to bad blood circulation is often caused by high blood pressure or a heart disorder. However, fluid build-up in the lungs can also be caused by factors not connected with blood circulation or heart problems. These factors include smoking (cigarettes are really harmful to one’s health), exposure to chemicals such as chlorine, ammonia or nitrogen dioxide, working with asbestos, kidney failure, pneumonia, drug abuse, pancreatitis, and high altitude sickness. Having fluids in one’s lungs is not a contagious condition unless it is caused by exposure to toxins. In those cases, the toxins will also affect everyone else who were exposed to them the same way as the patient. The first step in treating this condition is to remove the fluid from lungs. This can be done by inserting a needle or tube into the lungs and use it to drain the fluid. This process may not be necessary if the disease is diagnosed quickly and the underlying problem that is causing the leakage is solved. This usually involves addressing problems with smoking, or encouraging the patient to eat a healthy diet. In severe cases an operation or diuretics (drugs to increase urination) may be needed to remove excess fluid.